He didn’t know what to do with them at first. The vet had never seen cats like these. In 2009, a pair of spotted cubs were dropped onto the doorstep of the Wildlife Rescue Center in Kaziranga, Assam, a tumultuous border region in Northern India whose forests are known for poachers and armed guerillas as much as elephants and tigers. The days-old felines looked like spectacled house cats—but a closer look revealed that they were in fact clouded leopards—one of the rarest species of big cat. The newborns were orphans, likely victims of the pet trade. Found by local villagers, wildlife veterinarians discovered that the cubs were members of a critically threatened species that counts around 10,000 animals. Like all big cats, their extreme specialization is a drawback, and the problem is a double-jeopardy of dwindling forests and poaching. With their cloud-shaped rosettes and stealthy movements, the cats are notoriously hard to spot in the wild. From India to Bhutan, Thailand, Myanmar, Indonesia, their habitat has been squeezed by human expansion. The options were either to lock the cubs up in a zoo, or euthanization. Dr. Bhaskar Choudhary—the lead vet at the center, a joint venture from the International Fund For Animal Welfare and the Wildlife Trust of India—couldn’t bring himself to do either. So, he decided to raise the cubs himself. But there was no guidebook. Mainstream science doesn’t know much about clouded leopards—whether they’re truly arboreal and hunt in the trees, their natural behavior, mating—so much remains a mystery. In captivity, these are the most difficult of the 36 cat species to breed, and males often attack and kill females during mating. Two clouded leopard cubs, rescued in India, were hand-raised in the first attempt to rehabilitate clouded leopards. Here they entered the final stage of rehabilitation where they walk the forests and learn vital skills to survive independently. Choudhary knew he couldn’t save the cubs alone. So the 42-year-old enlisted a team of vets, a photographer, a poacher-turned-conservationist, even the Indian army, and began a project to re-release the cubs. Over the next seven years, they would rewild half a dozen clouded leopards, a scientific first. But despite such success, the work was not touted as revolutionary, or published in research journals. Some biologists have poked holes in the project’s science. Wild cats shouldn’t be subject to any human contact, they argue, the methods in India so unorthodox that they’re scientifically worthless. Should it matter if research norms were bypassed since the results helped save members of a critically threatened species? And if these and other counterintuitive efforts benefit endangered animals, could the traditional scientific approach—at least in this case—perhaps be flawed? Like many of his countrymen, Choudhary grew up in a small village, in close contact with wildlife. He saw his first elephant as a boy, common in a nation where the pachyderm is a beast of burden. As an adolescent, Choudhary and a group of friends once crossed paths with a tiger with a cub, perhaps the most dangerous encounter on the subcontinent, where about 85 people are killed annually by shere khan. Choudhary ended up studying to become a wildlife veterinarian. After graduating from university in 2000, he took a job with the IFAW’s Wildlife Rescue Center, an outpost on the outskirts of Kaziranga National Park, a sprawling forest bordering Bhutan. He would regularly treat injured creatures. Over 16 years, he’s handled “close to 1,000” animals. In 2009, villagers brought Choudhary two clouded leopard cubs, brothers he christened Runa and Kata. Clouded leopards are the smallest big cat, topping out at around 50 pounds, a tenth of the size of an adult tiger—leopards so rare that Choudhary wasn’t quite sure what to do with them. “When we started, we were almost unconvinced with our own idea,” he admits. 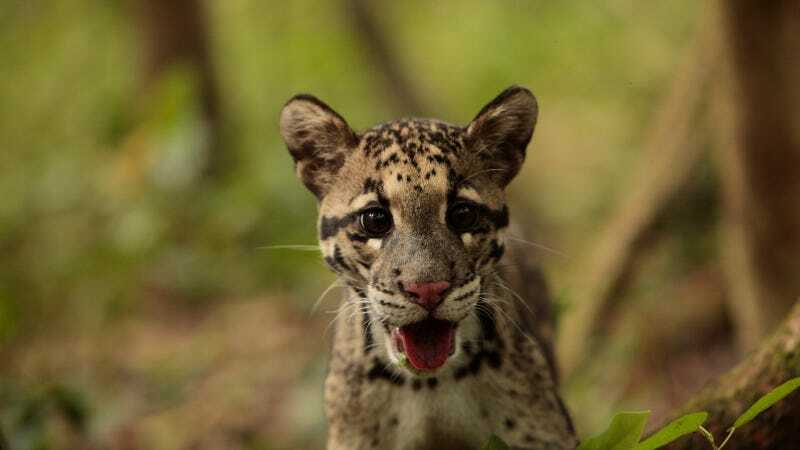 Attempts to reunite two clouded leopard cubs, found by woodcutters at the Kuklung Range at Chirang district near the Indo Bhutan border, to their mother failed after three days of constant effort. Those keepers included Maheshwar Basumatary, an ethnic Bodo tribesman who spent years as a poacher during Assam’s period of unrest from 1988 to 2001. After 2001, Basumatary, like many poachers, surrendered to the government. Provided a job as a conservation volunteer, he was now tasked to protect the forests he had once pilfered. And working with Basumatary, Choudhary says, opened up new insight onto the leopards. Dr. Panjit Basumatary also played a major role as a vet. And wildlife photographer Sandesh Kadur began filming what would end up becoming a National Geographic documentary. Local villagers were supportive, so was the Indian army, ensuring the territory was safe. But the group had no idea if the cubs would even be eligible for release. This was the most important moment. Hunting meant survival—and success for the team. And they did hunt, so well that their parents stopped feeding them all together. In May 2010, Runa and Kata became the first rehabbed clouded leopards in India to be radio-collared and released. But soon after, renewed conflicts between the army and insurgents forced the team to vacate the area. Unable to check on their former wards for an entire year, it was a huge blow to their research. When they did return, they were escorted into the jungle by armed guards. And what of Runa and Kata? Locals had reported sightings of a spotted cat with a collar. Camera traps were installed, and after exhaustive searching, they revealed a cross-section of local wildlife: spotted deer, elephants—and a collared clouded leopard. “We don’t know if they are still alive as of today, but they survived for a year. We have hard evidence of that. I hope that they are alive." Rescued clouded leopards undergo rehabilitation in India. These pictures show the leopard cubs during their acclimatization stage, just weeks away from being collared and set free. In May 2011, another pair of cubs—a male and female—were found by a man illegally cutting trees in nearby Manas National Park. After he brought the month-old cubs to the center, the plan was to reunite them with their mother. Multiple attempts to do so failed, and the team reemployed their original program. Less than a year later, those cubs were successfully collared and released. In 2015, a lone cub was rescued, and now remains on the path to rehabilitation. Earlier this year, the team completed a release following a surgical intervention, another first. But without empirical data to formulate a larger take on the species, the project is considered unprofessional. Choudhary seems resigned to the fate that without better monitoring, his efforts will remain misunderstood. Tiger cubs as young as seven months old are found to survive without a mother, he says, without being taught hunting skills. Goodrich, who has spent 17 years in Russia studying, rehabilitating, and releasing wild tigers attributes that to the phenomenal instinct prevalent in all cats. In many ways, Goodrich’s line of thinking is right on, considered a gold standard. But perhaps there’s more than one way to teach a cat? Choudhary maintains that the work isn’t interfering with natural behavior, or sending the wrong message. And he believes that the cubs learned from each other—not the keepers. But the question of habituation is warranted. In the U.S., de facto wildlife managers like the California Department of Fish and Wildlife are strict when it comes to predator control—and for good reason. For bears in California, that means euthanasia if relocation fails. For mountain lions, “we immediately return them back to habitat whenever possible,” Hughan added. Problem animals don’t often get second chances. Yes, clouded leopards have the longest canine teeth of any felid—resembling a modern, if mini, sabretooth—but they’re very small, much smaller than bears, mountain lions, and in this case, most Indian predators. The concern is valid. However, because these animals are so endangered, conservationists are divided. “It’s totally not all black and white,” says Beth Schaefer, the LA Zoo’s general curator. Schaefer oversees all of the zoo’s animals, including snow leopards and tigers, and in a role at the Houston Zoo, she worked with clouded leopards. The pluses of this work come down to whether the animals will be released in areas with people and if there’s enough prey for them, factors Schaefer says could mitigate habituation. Ultimately though, much of the released species’ survival—any species—is chance. Many zoos have released animals back in the wild, “even zoo born animals,” Schaefer says. Black-footed ferrets, golden tamarins, orangutans, attempts with gorillas. Why not clouded leopards? Other counterintuitive feline work could further help change minds. Studies by Panthera and the Snow Leopard Trust have shown that monks in China and Mongolia are the unlikely saviors of the snow leopard, where 80% of the cat’s range overlaps with monasteries which act as unofficial conservation areas. To date, the National Geographic documentary “is the only way we have shared our experience with the world.” But that may change. After the film aired in February, Choudhary’s was flooded by giddy emails and voicemails. Who knows, maybe it will lead to donations from abroad, better equipment to track releases? Maybe even leading feline researchers will join and legitimize the efforts by recording enough data to publish in a leading journal? Adam Popescu is a writer living in Los Angeles.